Byetta, an injectable therapy for blood control of type-II diabetes patients manufactured by Amylin and Lilly, has been taking punches for links to pancreatic injuries. Now, a whole new line of injuries is entering the ring—kidney injuries. The FDA has received post-marketing reports (complaints from patients and doctors after a drug is released to the public) that some patients have developed serious, life-threatening injuries while taking Byetta. 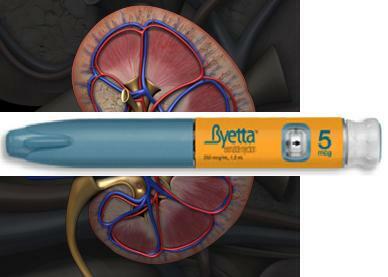 In the three and-a-half years since Byetta’s release, the FDA has been notified of 78 patients with “altered kidney function.” According to a November 2, 2009 FDA alert to healthcare professionals, there were 62 patients with acute renal failure (sudden and severe loss of kidney function), and 16 patients with renal insufficiency (decreased ability of kidneys to remove waste from the body). These problems occurred as soon as 3 days after taking Byetta, and as long as 2 years after starting a regimen of Byetta. 91% of the patients required hospitalization. Of the patients who reported problems after taking Byetta, four died, eighteen required dialysis, and two had subsequent kidney transplants. In some cases the injured patients had pre-existing kidney disease, but some patients had no prior history of kidney problems.